Highly talented radio performers are usually highly volatile personalities. That’s why it seems they are on an emotional roller coaster most of the time. You know that personalities who are confident and feeling good about themselves are more successful. As a manager, or person responsible for coaching talent, your job is to help them remain fearless on the air by stay grounded and focused. That’s how they can give you more of what they’re great at. But it’s not easy. Most great personalities are highly reactive, emotional and sensitive people who tend to have very high highs and very low lows. Talent coaches, programmers, managers and content directors should invest time to help air talent maintain perspective and remain focused on what’s most important. Here’s three ways you can help them. Enjoy great ratings. Share great ratings. Recognize great ratings. Celebrate great ratings. But don’t let ratings become your focal point. Focus on excellence and the process of creating great radio that produces great ratings. When you celebrate great ratings results, place your emphasis on what caused it. The great basketball coach John Wooden never let his players revel in the wins or be depressed over the losses. Instead, he emphasized the process of winning. His philosophy was that the winning would happen by focusing on excellence. Ratings are volatile. Many factors influence the results. Any weekly, monthly or quarterly may be coincidental or it may be real. You never know for sure what causes short term ratings fluctuations. By the same token, don’t become depressed over a ratings setback. Acknowledge it and move on. Focus on the process of creating great radio, of causing the audience to respond. Let the ratings take care of themselves. Removing or reducing this stress point will help them relax. Avoid being overly critical about one show or one segment. When you freak out over a bad day, it causes talent to be fearful. And fearful performers aren’t as interesting. A major league baseball team plays 162 games in a season. A smart baseball manager realizes that every team wins at least 55 games and loses 55 games. It’s what happens in the other 52 games that determines a champion. Every show has bad days and bad segments. Every show has good days when everything goes well. That doesn’t mean you should ignore poor performance. Analyze those bad days, but don’t obsess about them. Again, focus on the process of creating great radio. Features: What's Your Carpool Karaoke? And on the other side of the coin, appreciate the great days but remember there’s another show tomorrow. Keep it consistent from day to day. Consider each complaint and criticism, but keep it in the context of the show’s purpose, position and the talent’s individual personality brands. Complaints happen. Some are valid, some are not. Talent should never get the impression that their stabilizing force (you, the manager) are influenced by an email from a listener, a phone call from an advertiser, a comment from a friend at dinner or a complaint at a promotion. Digest it and manage the information flow to remain even and consistent every day. Roller coasters are fun at the theme park. Not so much when a manager reacts to every little thing that happens. Maintaining a consistent, stoic perspective will build confidence and stability for your show. And in doing so, will keep make them more consistent each day. In this fast-paced eBook, I share 16 ways to excite today’s young adults in new, creative ways. 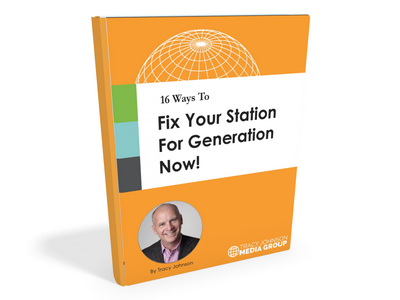 Based on extensive research, the findings should change how your station sounds forever.